Choose to include or omit a remittance envelope. Upload your pre-addressed PDF file to our secure site. Your per piece price will appear on right side of your screen along with options to select. $0.80 for the first page and $0.08 for each additional page. If addresses don’t align, we will make the necessary adjustments and mail your documents for an additional $0.03/envelope. Options include certified, oversize, color printing, foreign mail, and more. Documents are mailed via the USPS by the next business day. The process is similar to what payroll service solution companies provide. Imagine the current cost to businesses if they still had to distribute their own payroll checks, keep a history of the transactions, and be totally on their own if something went wrong. In the same way, DocuSend automates a labor-intensive task that is fundamental to the health of your business. You no longer have to manage your payroll internally, and now, mailing your invoices and documents can join that time-saving, convenient suite of services! DocuSend is great for mailing a single page document all the way up to 4,000 documents. If you mail more than 4,000 documents per month, contact us for additional discounting. Documents are printed on 8.5" x 11" paper and inserted into a # 10 window envelope. Each envelope can contain up to 7 pages (or 6 pages and a remit envelope) in the DocuSend automated process. Your documents are mailed by the next business day. Emails are sent out when the file is received. You can then opt to save money by combining those documents into one envelope. Click on the button and your shopping cart will be adjusted to reflect the reduction of envelopes and the increase of additional pages. Do nothing if you want them mailed in separate envelopes. It's that easy. 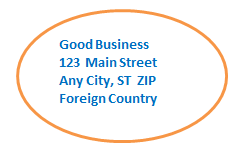 In order for us to merge, your mailing addresses must match exactly. If you have additional files to Merge, follow the steps above and after the initial two files are merged, upload your next file. If there are duplicate addresses, you'll see the yellow message box again and you can click to merge the third file with the original file. The Merge Feature works great for adding statements in with your invoices (for those that might have past due/outstanding invoices). This is helpful for QuickBooks and QuickBooks Online customers who had to mail them separately in the past. Include a # 9 window remittance envelope for your customers to remit their payment back to you. 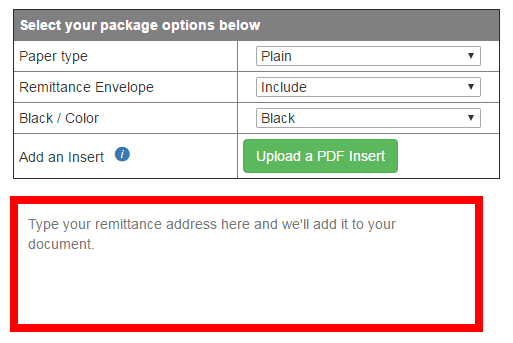 Select to include a Remittance Envelope in package options. If we don't detect a Remit To Address, we'll prompt you to key it in. We will place it in the right spot on your invoice so it will show through the window of the # 9 envelope. We'll remember it for you so when you upload your next rile, you don't have to type it in. Envelopes that contain more than 7 inserts will incur an additional charge per envelope that includes manual processing, additional postage and a larger envelope. Using our DocuSend certified mail feature makes it much easier to send sensitive documents and mandated mailings throughout the USA. •After uploading your documents, go to Review Individual Documents and under the Special Handling menu, select individual envelopes to be mailed as Certified. Send certified documents online with DocuSend. Only $7.05 more per envelope. Available only for United States mailings. Access your portal to track the certified numbers. Along with the mailing service, you get free access to Management Dashboard Reports. Know exactly when your documents were mailed through your personal report portal. View details such as File Date, Date Mailed, and Cost. Along with the mailing service, you get free access to the Image Bank in the DocuSend Portal. The "Image Bank" archive and retrieval system houses six months of mailed documents. Even reprint them instantly through your customized portal. Create your generic document and save as a PDF, PNG, JPEG or JPG files. Upload your mail file to DocuSend and select your job specifications. You'll see the option to "Add an Insert." Click on the Upload an Insert button and browse your computer to select the insert you want to add to your mailing. The insert is printed in black or color on 8.5" x 11" paper and gets placed as the last page of your customized invoices or letters. Price to add a black and white insert is $0.10/page and to add a color insert is $0.17/page. Using the DocuSend insert option saves you time and money by not having to do a special mailing. Think of the postage savings! Do you have mail that needs to be mailed outside the USA? DocuSend will mail it for only $0.73 more per one ounce envelope. Just make sure you add the country you are sending it to under the City, State Zip line. Remember, the country MUST not be abbreviated and it must be by itself as the last line of the address block. Are you in a foreign country and need to send mail to the United States? DocuSend is the perfect solution. Typically, all mail originating outside the USA that needs to be delivered inside US territory is subject to examination by the US Customers and Border Protection before it even gets to a USPS sorting facility. That could potentially delay mail delivery by 2 to 3 weeks. DocuSend's print- to- mail web-based service delivers your invoices or letters to a USPS facility by the next business day. When you mail into the USA from a foreign country, you pay the regular DocuSend rate which includes first class postage. No extra foreign postage surcharge.